Today’s post comes from Jennifer Taylor of Mom Tricks. She’s sharing advice on something that I have a super hard time with myself, getting picky kids to eat veggies! Enjoy! Does this dinnertime conversation sound familiar? If it does, you might just be dealing with a picky eater. My son was a very picky eater, and my husband and I spent countless nights begging and pleading with him to try his veggies. We were long past the late-night diaper changes and feedings, and since neither my husband or I were picky eaters, we didn’t expect it at all. It’s definitely not easy to deal with. But over time, we got him to open up more and more, and we made a lot of progress in fighting against his picky eating habits. I’m going to share with you what worked for us, and I think it would work for every other parent out there who’s dealing with a picky eater. What I find works the best is to let them feel involved in making the meal. Put yourself in the position of a timid, young child who is being asked (and begged with) to try the strange new foods in front of them. A big part of it is how unfamiliar it all is. But, if you let them be involved with making the meal, it instills a lot of confidence, and it eliminates the fear of the unknown that comes with eating new foods. So, here’s what I tried, and it worked really well! First of all, I let him pick the veggies. This is a great and easy first step in getting them involved in creating the meal. I took him to the grocery store, and let him pick out which veggies he wanted to use. Since he was young, I found it easiest to pick out a few different ones and let him pick one out. In our case, he chose a zucchini. Pick out veggies that you feel like making something out of! For example, you could pick out a few nice carrots, a zucchini, a potato or two, or anything else you like from the veggie section. Then you let them pick out what appeals to them! If your child is older, you could let them take the lead and pick whatever they want out. Another idea is to tell them you’re going to make something familiar that they love, like pizza, but put new toppings on that they might not be totally comfortable with. It’s a good compromise for the pickiest of eaters. Then, I let him pick the recipe. I spend (too much) time on Pinterest, and I realized it’s the perfect place to find awesome, tasty-looking recipes that work perfect for helping a picky eater deal with their fears! I just searched for zucchini recipes, and like magic, I got literally hundreds of awesome dishes to let my son pick from. I personally love zucchini, so maybe I’m getting a little more excited about it than most people, but this really works well. I just picked from a few that I felt like making, and let him pick between them. So, this is all you have to do! Just do a Pinterest search for whichever veggies you have on hand, and let them pick from them. Once you do that, you can either work straight from the recipe on your phone or tablet, or just print it off or work from memory. Do whatever works best for you! Finally, I let him help prepare the meal. Since he was young, the level of involvement wasn’t as much as it would have been if he was a little older, but the important part is that he was actually involved! I had him wash the zucchini, as well as add spices and seasonings to it. This is really easy and basic and even the youngest of children can handle it safely! If your child is older, they could have more involvement. Cutting veggies and mixing things up are great ideas, as long as they’re old enough and do it safely. Don’t give up, and stay patient. Dealing with picky eaters is by no means easy, but it’s important to keep your patience and to be persistent. I promise you that if you try to be understanding and patient with your picky eater, things will be much easier, and with a little persistence I know you’ll overcome it! These are great tips and I completely agree with you!!! I have a picky eater too and getting him involved does work. These are such terrific tips! 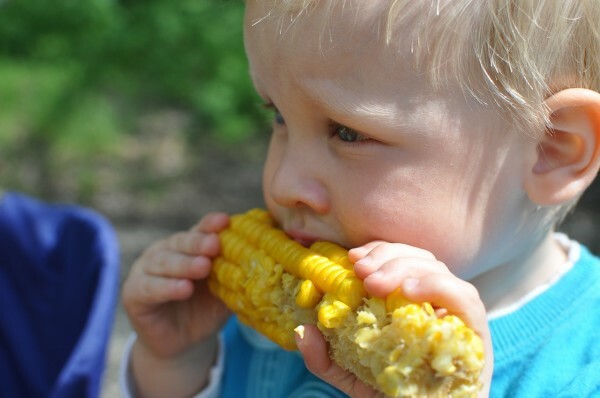 My son was a picky eater, and it was tough getting him to eat his veges. But I let him pick the veges he liked and we made them the way he liked them. I think it is a good idea to let the child pick a lot of his food and recipes and help out with the cooking because that way they will eat their food! Those are great ideas to get the child more involved. If they’re proud of what they chose and the recipe they made, then they will want to eat it!